What does the Green River Gorge look like from above? That is the question I asked myself when I enlisted my friend, a pilot, to fly me over the Gorge in April of 2017. My pilot friend, Mike, and his plane. Before that day I'd only seen the gorge from the depths or along the cliff edges. Above the gorge the sky is framed in a forest or 50 million year old sandstone. Planes fly overhead along with Eagles and Osprey. Along this narrow airspace cliff swallows perform aerial maneuvers catching insects in the evening sky. 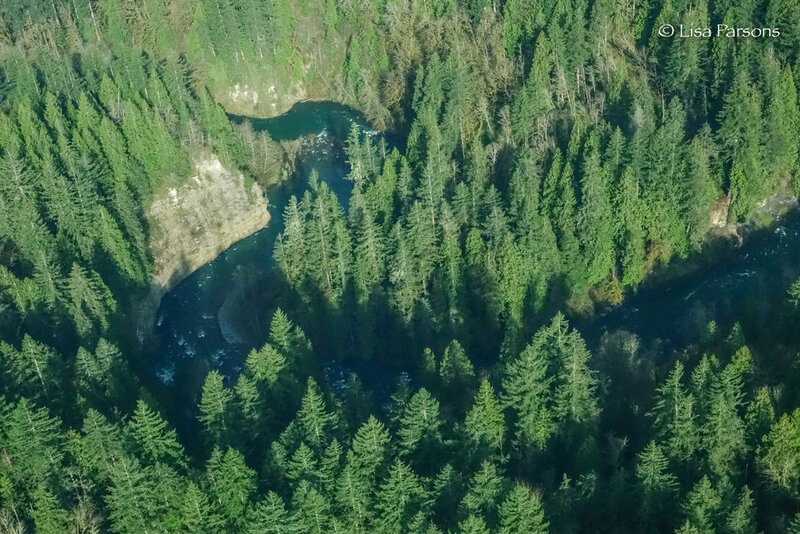 Below, on the ground and in the river is a secluded corridor where bear, cougar, bobcat, coyote, and river otters can move freely from east to west unencumbered by roadways and houses. White water boaters, hikers, fishermen seeking solitude or adventure can find it here. The corridor is long and snakes between one landscape to the north and the one to the south. From the highway 169 you might consider the gorge a big ditch that you have to cross to get from Black Diamond to Enumclaw. There is no way through it, only over it. From the ground it is hard to gauge the profoundness of this deep river carved gorge. From the air it is equally elusive but more is revealed. At the eastern edge is the foothills of the upper Green River watershed. Up against the foothills is the the barrier of the Howard Hanson Dam. The dam supplies water to the city of Tacoma and is used for flood control. It filled the upper gorge which was also quite unique. Richard Bangs, the founder of Expedia and one of the first people to raft many of the world’s major rivers, rafted the upper gorge before it was dammed. Now that gorge is a lake of water. It was a dam that led Wolf Bauer in the 60s to advocate for creating the Green River Gorge Conservation Plan. He had watched the Cowlitz river canyon disappear under a reservoir behind a dam and knew that he had to save the the Green River Gorge. The evidence shows what could have happened to the Green River Gorge without his efforts to protect it. Hanging Gardens State Park with the encroachment of a gravel pit to the north. Surrounding the upper dam and reservoir is a tapestry of clearcuts and third growth timber forests. A green steel railroad bridge marks the transition from the upper watershed to the middle watershed. The foothills lie above it and the rural transition lies below it. Just below the railway bridge the Kanaskat / Cumberland Road crosses over the river and is one of only 3 bridges over the gorge. To the north of the bridge is a gravel pit. Below the dam are a smattering of houses before the river enters Kanaskat State Park. There the river narrows as it enters the actual Gorge. The uppermost bridge crossing the river before the river enters the gorge. Foothills above and Kanaskat State Park below. From above the gorge looks like a deep green snake as it twists its way through a millennia of river carved sandstone. Cutting through thick evergreen forest. Wherever the landscape is more forgiving you’ll see a house or two along the edge. The river at Kanaskat State Park where houses stretch toward the northern edge. Wolf worked to protect the land from the rim of the river to the bottom of the gorge but beyond that there is very little protection for the uplands beyond the river’s edge. Already view homes are cutting away forest. Still there is a sense of wild remoteness where forest remains, towering cliffs create quiet green pools of water broken only by a kayaker, a rafter, or merganser riding the river’s currents. The power lines signal to boaters that the infamous whitewater rapids Mercury and the Nozzle lie around the corner. A narrow gorge and tight turns in the river create the expert level whitewater run in the gorge. Upper gorge looking upstream from the Green River Gorge Resort. Resort allows public access for $5 per vehicle. One of the few developed areas along the Gorge. From Kanaskat to the Green River Gorge resort is the upper gorge and the most wild and isolated area of the river. Only broken by a power line corridor that cuts across the river just above the famous rapids Mercury and the Nozzle. Single lane bridge near the old Green River Gorge resort. At the Green River Gorge resort is only the second bridge to cross over the gorge. A small gathering of homes and a private access to the river lies there. Trails lead down to cascading waterfalls, sandstone footpaths, and a green alley of water that ends in a play wave called Paradise ledge. Towering cliff wall is called Grand Canyon of the Green by local whitewater boaters. Beyond the ledge the river sneaks back into seclusion past towering white and yellow sandstone cliffs, by a myriad of springs that topple out of the surrounding hillsides and fill the river with cold clear water. Fishermen’s trails careen through thick forest, Devil’s Club, and along steep cliff walls to small open beaches perfect for casting a line into the deep green pools below the whitewater rapids. 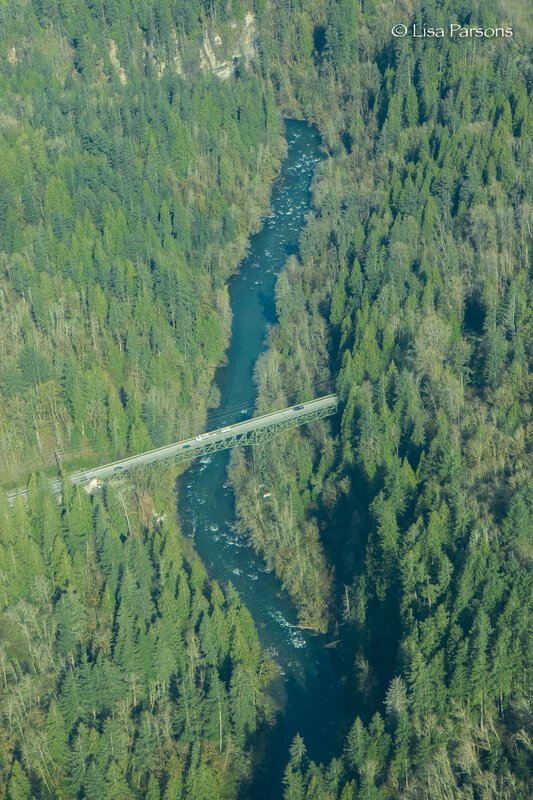 Highway 169 crossing over the big ditch between Enumclaw and Black Diamond. Just below halfway, highway 169 crosses over the river and marks the transition of the river from a deep remote canyon to wider forested slopes with rural farms and houses encroaching closer to the edge. To the north Black Diamond grows around the gorge’s edge. To the south farmlands of the Enumclaw plateau stretch towards the White river further to the south. River corridor gives way to rural working forests and then to farmland on the Enumclaw Pleautea. The terminus of the Gorge is at Flaming Geyser State Park. This is where the gorge officially ends and the Green River Valley begins. This river carved canyon lies just a few miles from over 2 million people. It is the last remaining east / west corridor of open space connecting the foothills of the upper Green River watershed to the Puget Sound lowlands of the Green River Valley. Farmland and open space has been replaced by housing and warehouses. Warehouses now fill a river valley that was once some of the richest farmland in the country. Between Auburn and Kent along the Green River. The airport lies on top of what used to be fertile farmland. From the air above it is easy to see why this area is so unique and worth continued conservation efforts that were originally started by Wolf Bauer in the 60s. Today they need you to help continue the effort. It is a unique opportunity for conservation in an expanding urban / suburban landscape that can help protect lowland habitat for wildlife and recreation opportunities for the adventurous among us.